In order to receive The Gridiron emails from the Booster Club, you will need to "Create an Account" located at the top of this page. We suggest you join us so that you can continue to receive updates from the booster club on a regular basis. WELCOME TO THE HOME OF THE PARKLAND TROJANS FOOTBALL BOOSTER CLUB! The Parkland Football Booster Club provides funding to help support the rich tradition of the Parkland School District football teams from middle school through Varsity. We are located in Allentown, PA. If you would like to join our booster club, please click on "Documents" on the left hand side and download the Booster Club Membership Form and mail your payment OR you can now pay your dues online by clicking on the Online Payments option on the left hand side of the website. New for 2019 season, dues are $50 for middle school families, $75 for ninth grade famililes and $100 for sophmores, juniors and senior families. IF you have 2 football players in your familiy the cost is for the higher grade player. 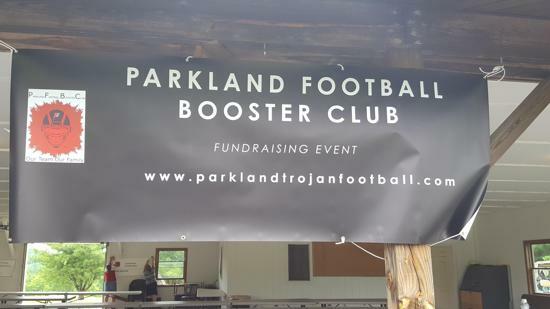 Your familiies benefit for joing the booster club are you will receive a Parkland Football Rally towel and a hotdog/soda punch card to be used at five (5) home games. With full membership you also receive $10.00 of the final banquet cost to your family. Most importantly you will have voting rights at the booster club meetings which are the second Tuesday of each month at 7 pm. Join the FAMILY! NOTE: Clearances are good for five (5) years. If you have provided clearances within the past year, you do not need to renew your clearances at this time. ©2019 Parkland Football Booster Club / SportsEngine. All Rights Reserved.